In the run for the big day, late nights, slacking with skincare, alcohol and salt intake can be common skin aggressors. These can lead to chapped, flaky skin that appears dull and lacking lustre or puffy, red eyes that have lost their sparkle. Now you surely don’t want to ignore your appearance whilst keeping up with your social life or decorating your home with fairy lights hence we present to you, Christmas Skin Emergency Tips. For bright peepers, resort to the old tea bag trick – it works every single time! Use it warm to get rid of any swelling, puffiness or redness. This will act as a comforting blanket over your eyes. Use them refrigerated if you want to transfer green tea and antioxidant benefits on tired, flared up eyes that can also do with a little bit of cooling. Ice cubes are the next best invention after sliced bread in the beauty department. They can revamp tired, dull and lack lustre skin in a matter of minutes and have been a runway staple for supermodels and Make-up Artists since decades as a quick pick-me-up. Ice cubes work at tightening pores which is great for you oily-combination skin girls. They also help bring blood to the surface of the skin, reinstating that flushed, just jogged look and encouraging blood supply to skin cells, giving the entire process a much needed kick start. There’s no skin emergency a mud mask and a damp flannel cannot solve. 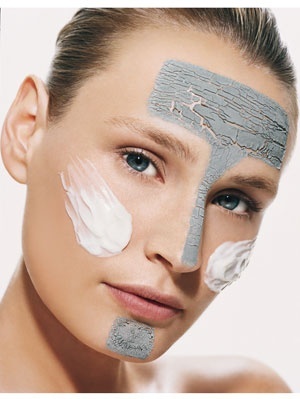 Mud Masks nowadays can be made at home or are available in a lot of variations to purchase in the market. They can be geared towards oily, dry or sensitive skin depending on your current skin concerns. Most contain Manuka Honey as well which is great at treating any bacterial infections and calming down breakouts. Apply a generous layer after cleansing and remove with a warm damp flannel. The warmth from the flannel helps absorb the ingredients better into the skin, also making you feel relaxed and de-stressed. The flannel also helps exfoliate and get rid of the last traces of the face mask. If you’ve consumed too much alcohol in the party preparation period, skin can feel dry, chapped and dehydrated in which case ditch the mud mask and opt for a more moisturising and nourishing concoction. After you have it applied nicely on your skin, cover your face with a damp warm flannel for a good 10 minutes to see brilliant results. For quick fix when it comes to extremely dry skin, we recommend coating the skin in a layer of hyaluronic acid serum prior to applying moisturiser and make-up. It helps hold onto water and moisture in the skin better and for longer. Post party, avoid coffee the morning after as all it will do is to dehydrate your skin and body even further. Opt for something like green tea which will detoxify your body and is great for your skin too. Keep a salicylic acid skincare product handy by your bed side for any sudden bouts of spots and breakouts. It will immediately reduce inflammation and bring down the spot in size considerably the next day.